Earlier this month I spent a couple of days in Seattle getting my braces removed. I visited the World's Fair site where I went 50 (ahem) years ago as a kid and finally got to ride the monorail. Woohoo! 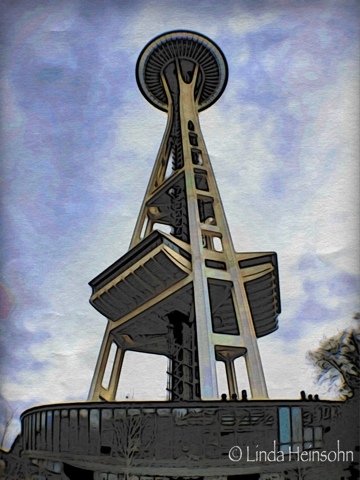 I took Space Needle photos with my iPhone and the Olloclip fisheye lens. There was no other way to get the whole structure from the base into one photo otherwise. Olloclip is AMAZING--three lenses in one! In post processing I used Moku HD I added a portrait filter on a white, watercolor paper layer. I like the look of people walking around on the observation platform below the giant structure that captured the nation's attention and imagination in 1963. Beautiful - I love the distortion and reflection at the base! Thanks, Mary! I agree that the Moku app does a good job obscuring the less attractive elements of that observation platform. Thanks for commenting!